Nothing makes you feel the pressure of getting out of bed in the morning like a ticking-time-bomb on the bedside table. It may look like it came in the mail from ACME, but all that went into this is some wooden dowels covered in craft paper and an Arduino-compatible board. The 7-segment display can act as a clock, or count down to your doom. You can set an alarm that requires you to clip the wires to shut it off. Each time that alarm is set the wires are randomly chosen; one will set of the bomb, one will safely defuse it, and the others do nothing. See for yourself after the break. The wires are easily replaced because they are connected via terminal blocks. It still seems like an awful waste of wire. We like the Think Geek bomb clock concept that works in much the same way but uses wires that have a male/female RCA plug pair that can be disconnected and reconnected without waste. This one will apparently be available as a kit, at which point the schematics and code will be released. But it shouldn’t be too hard to build one from scratch yourself, and it’s an obvious winner if you’ve got kids. The wire isn’t a “waste”, it’s the point of a flamboyant cliche. But, not everyone likes Calder’s work, either. Wake up or die, very motivating in the morning. kinda scary to think how easy it would be for someone to port this into an actual bomb. All this is is a ridiculously complex alarm clock. It would be a very poor choice as a real timer. 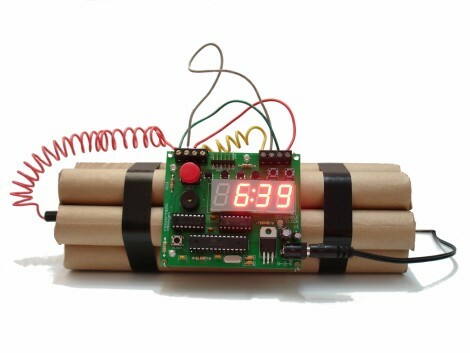 That ThinkGeek bomb clock doesn’t blow up, it flushes! Here’s a REAL alarm clock ! Where’s the PC crowd that chimed in on the muslim GPS “hack” ? It shouldn’t need saying, but DO NOT TAKE THIS TO THE AIRPORT! They tend to get paranoid around any DIY project, and this one is built to look an awful lot like a bomb. You will be detained for questioning. You may be sent to GitMo. I will not feel sorry for you. Not only shouldn’t it need mentioning, it doesn’t. It’s one thing to wonder why your minty-amp won’t make it through, but you’d have to be damaged to expect this to. What happens when you unplug the DC barrel jack? Until the next board revision? sounds like we need a backup battery. Yes, a battery or capacitor backup and firmware that recognizes that you have tried to circumvent the system and accelerates the countdown as punishment. I was thinking of making this one, but can’t find any shops that can sell me any TNT. I guess I’ll have to use dynamite instead. Seems kind of dull, there is no skill involved in clipping the correct wire, just random luck. Not very stressful, just frustrating for someone who doesn’t like to lose. To add an element of skill, you should add an led for each wire and have it cycle through them one at a time (randomly or in order) and you have to clip the wire when it is not lit up. As wires are clipped, they are removed from the sequence, making it more difficult to clip a wire that is not lit. Also, it could speed up as more wires are clipped, increasing the difficulty. I always imagined that the best way to make an alarm clock reliable is if it would be turned off by a button located far away, maybe in the kitchen or somewhere. I think the clock presented here is going to be a bit annoying after a few wakes, and not in a constructive/good way. I’m the designer of this, and just wanted to clarify that this functions as a normal alarm clock with a normal beeping, and snooze alarm, etc. If you press the red button, the countdown sequence runs. You can also use the countdown sequence as the alarm if you want to require defusing at wakeup time, but most people probably won’t want that…! thanks for such a great product. is there a way to set one set of wires as the designated wire to defuse the clock? we are trying to set up a game which clues leads to only one specific color coded wire is the one to defuse the clock. If you could assist that would be wonderful! thank you very much in advance! Wakeing up should never be ALARMING, or negative in any way. I’ve been using a Nintendo DS as an alarm clock for years, for that very reason. It’s volume starts low and ramps up within 10 seconds to full volume. No more waking up with a start at a blaring high volume annoyance. Moonshell is nice isn’t it? Combine keypad, magtrix based wires (i.e. easy to put back) and a talking circuit, and you might have a novelty product to sell. Actually, I do think it really is cool. I don’t know about the clipping wire stuff, when waking up, well, I’m not really up for puzzles. Pete had a good idea for an application in a game kind of scenario. Too bad 9/11 crushed the marketability of it. The world got a whole lot more serious that way, I’m afraid. My god another awesome project! Just make the wood TNT batteries to make the whole thing have a purpose in disguise. cute, in a Do Not Put this in the passenger seat and go any where with it. In fact do not take it anywhere outside the house or leave it in a window. I hate what things have become. Cool looking project but post 9/11 there is no sense of humor about these things. Did I say Cool looking. Would do this myself but I don’t want the bomb disposal bot in my bedroom. What does 9/11 have to do with it? People didn’t know what bombs looked like until… planes were flown into the WTC buildings? Have you been living under a rock for the last 10 years? Also, don’t ever call the cops while you have one of these in the house…they might not find it as funny as you do. On the plus side, you might get to see their cool robot before they haul you away. Or just don’t have it on display when calling the cops? Two things can be done to “fix” the wire cutting “problem”. Either they use a screw driver to unscrew the wire they want, or replace the screw terminals with banana posts or speaker push terminals, or something similar. i made a “bomb in a suitcase” prop for a show i did the special effects for. same idea, but the wires did nothing, and nothing actualy happened when it reached zero, (the show didn’t require it) but it did have a giant led display and fake dinamite! my favourite part of the whole build was the “film time” feature. basicly i programmed the counter to get progressively slower as it got closer to zero. in the theater it was fantastic because when the clock started ticking it was about 1/4 second per tick, but at the end it was like 4 secconds per tick. add this to your alarm clock! I question the safety of wire cutters in the hands of a suddenly awakened child or adult. While it’s really cool I wouldn’t even suggest having this on display. My father’s friend had an alarm clock like this and the neighbors saw it in the window and called the cops. The scariest thing that can make stampedingly run away to the movie viewers in the theatre is the yell of “the bomb.” The best device to drive a person out of bed as soon as he or she wakes up is unquestionably this your device. Cool. Keep doing good and funny job.